With the Halloween season upon us, you sometimes start thinking about the strangest things. I know I want to be prepared for any scenario, so in my emergency bag, there are certain “essentials” I would need in order to survive a zombie apocalypse. By essentials, I’m literally referring to the essential oil blends I would include in my arsenal. 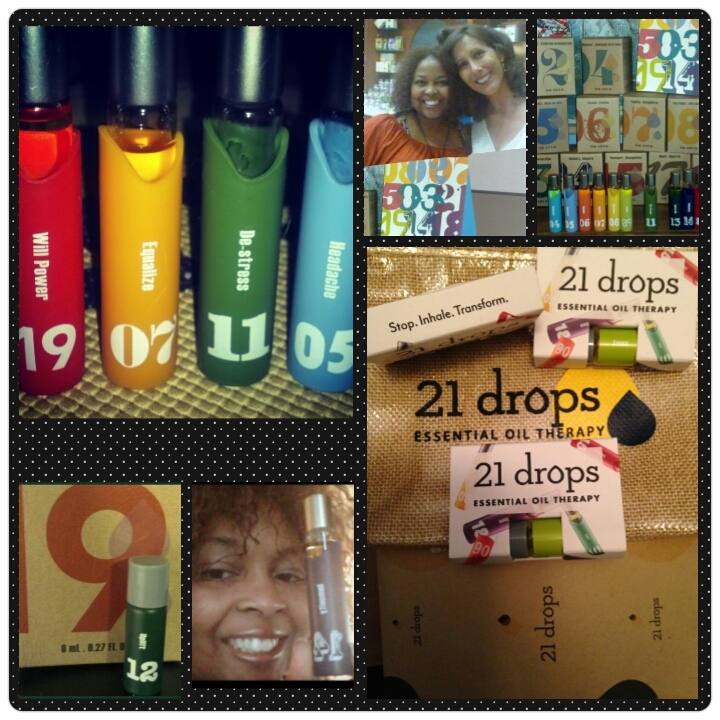 21 Drops essential oil therapy offers “21 Blends. 21 Solutions. From Headache to Heartache”. Zombie Apocalypse? YUP! There’s a Drop for that! Here are my top six recommended 21 Drops essential oil blends you should have on hand to help survive a zombie apocalypse. De-Stress – As soon as the news breaks, your blood pressure is sure to shoot up and your anxiety level is likely going to rise as the situation escalates. #11 De-Stress is blended from frankincense resin oil, lavender flower oil, ylang ylang, and german chamomile to help relieve tension, steady the nerves, and stay cool under fire. Will Power – Once you’ve realized this is not some media hoax or isolated event, you’re going to need to put together a survival plan of action. This is not the time to sit around and wait for a miracle. The cedarwood wood oil, ginger rhizome oil, and geranium leaf oil in #19 Will Power helps restore your motivation and provides you with a dose of determination and drive. Take control of the situation and master your own destiny! Immunity – Pretty self-explanatory in my opinion. The more resistance you build up to common ailments, the better off you will be in fighting infection. You’ll need to be in your healthiest state in order to face the difficulties that lie ahead. And who knows, since it’s never been tested, we really don’t know whether or not the anti-microbial properties of #14 Immunity blend will keep you “immune” from a zombie’s attack. But one thing’s for sure, I’d rather have it with me than not, just in case it does!! Strength – Bottom line. Unless you find a really good hiding place and plan on staying there the whole time until the apocalypse is over, you are going to have to FIGHT! #03 Strength helps give you the confidence to overpower your obstacles. Fused with cedarwood wood oil, rosemary leaf oil, and rose flower oil to bolster your endurance and courage. Pain Relief – There will be bumps and bruises along the way, aches and pains. Whether a backache from hiding crouched down in that cellar all day, or a pulled muscle in your leg from that Chuck Norris roundhouse kick you attempted on a zombie. Use #08 Pain Relief, blended from myrrh resin oil, juniper fruit oil, ginger rhizome oil, and helichrysum flower oil to reduce inflammation, pain, and stiffness. Carry On – Let’s face it. Everyone is not going to survive. There will be loved ones and friends who just won’t make it, or have joined the ranks of the walking dead. But for your own sanity and perseverance, you have to pick yourself up and keep moving along. The oils in #13 Carry On helps guide you through those rough emotional traumas of loss, heartbreak, and grief. Though we are not currently in the middle of a zombie apocalypse, I still utilize 21 Drops essential oil blends on a daily basis. They allow me to easily integrate the benefits of essential oil therapy into my daily routine. 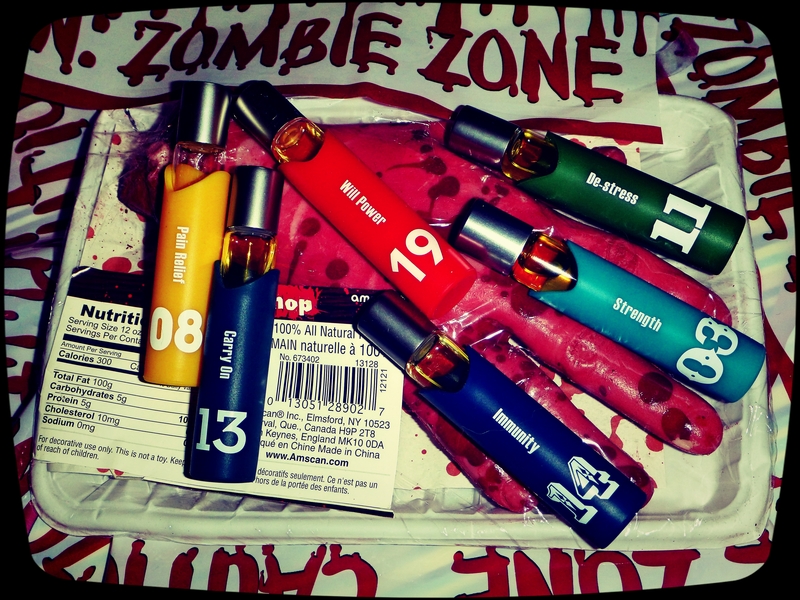 So best believe, wherever I am when the zombie apocalypse strikes… I’m sure to have a few 21 Drops blends nearby. Will you? 01, 02,03, 04…..21 colorful drops ignite my spirit. Its more than just a product, it’s a total sensory experience. From the visually enticing bottles, inhaling the earthy, flowery, natural scents, and feeling the oils permeate your being; to speaking the included bi-lingual affirmations aloud for reassurance to your own ear . Awww (deep breath), you can almost taste the wellness though there is nothing to ingest. Since then, my drops inventory has increased substantially (especially since they really work), and I’m only a few bottles away from my own personal Blackjack – having tried all 21! Of course, there are my repeat users, I hate to call them favorites, because they all serve a specific purpose, but the Immunity – 14, De-Stress – 11, and Headache – 05 blends seem to need re-ordering more frequently than others. These compact 8.0 ml bottles, outfitted in their own custom jackets, are quite the social trendsetters. Easy to throw in a purse or your pocket, and utilized by inhalation or topical application, my 21 drops have shown up at work/school (Focus – 09), on the airplane (Immunity – 14), at parties (Hangover – 04 ), walks in the park (Decongest – 15), during workouts (Willpower -19), and in my dreams (Sleep -18). These aromatherapy oils have pretty much become a permanent part of my lifestyle. When faced with a decision on what to throw in that clutch purse for a night out, or a networking mix-n-mingle, it usually boils down to: cellphone, keys, ID, lip gloss, money, and 21 drops! I had the pleasure of meeting 21 drops creator and visionary, Cary Caster, last year at “The Shift – A Movement Toward Absolute Wellness”, an event hosted at The Pearl – Modern Spa & Boutique. Cary has a degree in Botany, and studied in Europe where she received her certification as an Advanced Clinical Aromatherapist. Her “modern approach to aromatherapy” allows a whole new generation of individuals to easily incorporate alternative therapies into their lives. To learn more about this amazing product, and to join the 21 Drops Inner Circle (for rewards, perks, and insights on new products and events) check out the 21 drops website at: http://www.21drops.com. Enter “hisinc” in the coupon code at checkout to receive 15% off your first order!